DJ Kuttin’ Kandi identifies as a disabled Pilipinx/Pin@y-American Queer, Writer, Poet, Theater Performer, Educator, Hip Hop Feminist, and Community Organizer. She co-founded Anomolies Crew. And in 2018, she has been named a Global Hip Hop & Cultural Ambassador, Rockwood Fellow, and Artist-in-Residence for UC San Diego’s SPACES and the San Diego International Airport. 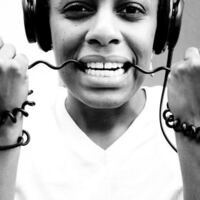 DJ Lynnée Denise is an artist working to create multi-dimensional and multi-sensory experiences that require audiences to apply critical thinking to how the arts can hold viable solutions to social inequality. She is a Visiting Lecturer at UCLA in the Department of African American Studies, and a Lecturer in African American Studies at CSU Los Angeles. Imani Kai Johnson is an Assistant Professor of Critical Dance Studies, and the co-founder and chair of the Show & Prove Hip Hop Studies Conference Series. She is completing her manuscript titled Dark Matter in Breaking Cyphers: Africanist Aesthetics in Global Hip Hop (Oxford University Press). Presentations are followed by dialogue with audience, then reception on the patio.